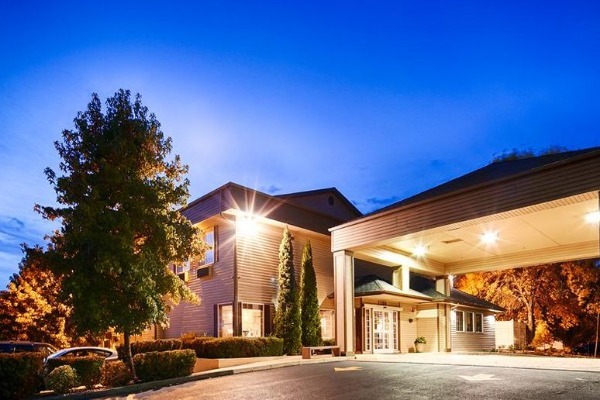 The Best Western Plus Prairie Inn is pet friendly, with a dog-park just across the street at Timber Linn Park. Guests can enjoy a hot breakfast buffet featuring potatoes, eggs, breakfast meat, biscuits and gravy, make-your-own waffles, fresh fruit, hot and cold cereal, oatmeal and a yogurt bar with lots of toppings. They offer high-speed wireless Internet, ample car and bus parking, free local calls and their property is 100% non-smoking. They have refreshingly clean and comfortable rooms featuring granite countertop vanities, a dryer, a coffee maker, a microwave, a refrigerator with mini freezer space, and a 40" flat screen TV with all the HD channels. Enjoy a fun, indoor heated pool and the spa and fitness center. There's also an on-site coin-op laundry and valet, and a 24-hour business center and front desk staff.